This game is like 99999 years old. Just put your shiny stuff up for sale already. Nobody is even playing. Oh, I get it. Because the Cartel Market IS the joke. Anthem still keeps the SWTOR crew too busy, for April Fools. The helmet on that trooper set would be amazing if you could actually dye it. Such a stupid design choice. You can dye it. Just need to get its reskin, “Crimson Raider”. A dead joke pretty much. Say goodbye to BioWare AND SWTOR along with it! Ben Irving definitely needs to be fired after this! 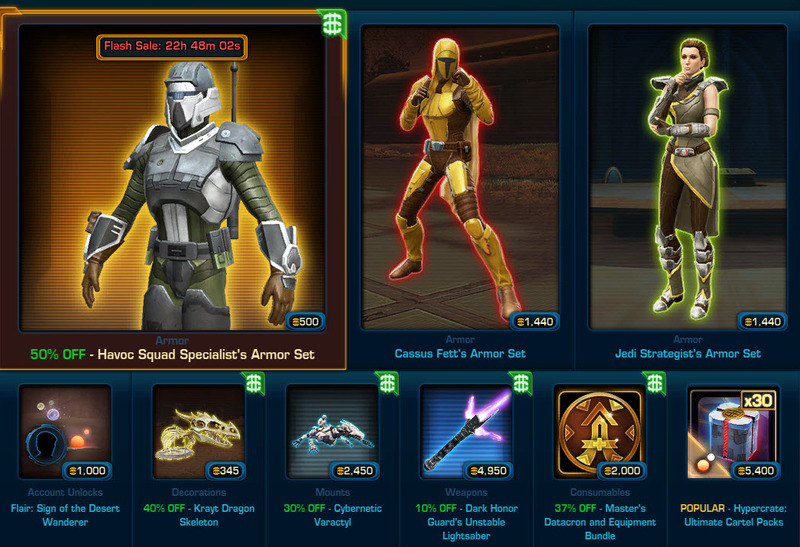 Oh wait that’s right the way they treated SWTOR. Wow, this stinks of incredible incompetence, straight from the top. Bombshells No’s 3&4 are just unbelievable. Nice job breaking it, BioWare! 1. Can this guy not afford a new shirt or jacket yet at 3 mil subs? 2. What’s with all the screaming? Idiot. EA and Bioware may be dumpster fires but this guy does no research on his own and just spends 45 minutes regurgitating an article and contributing to outrage culture BS with his hyperbole. I mean, that’s what youtube is all about. Just put something like “They did WHAT?!? !” in the thumbnail, make the title “X company EXPOSED! They’re going DOWN!” and you get easy clicks. Guess what… Edmonton finished Anthem (and they are focusing now on next DA game?) and now they pass it (anthem) to Austin studio (which had swtor already) so, yea… i don’t want to sound dooming here but i think swtor is or will be (eventually) fucked up by anthem, why? Because Austin would have to shift at least half it’s team to support both games (and tbh i don’t think they have enough man power to support fully both games at once). In short term they may “somehow” manage to do stuff for both games, but in the long shot i guess it will lead them to heavy attrition which game support the most and that could lead to more stressful moments and dire chaos… i wish i was wrong, but i guess that’s gonna happen sooner or later. I’m surprised that an article still hasn’t been added to this site. what do you mean foolballz that the game is more alive than ever? mmm? Time to resub? mmm? Nahh can’t be happy for a miserable planet like Dantooine, incredible they still have budget for this. Still i believe they need to release at least “something” before the Skywalkers move get released…next year let’s see…BTW i’will boycotting that movie, not a single penny for Disney not anymore…. The comments on this webpage is like cancer. There is no hope for them. Oh you can try and fight it off for a little bit but, in the end… You sad mother fuckers need a life for sure.